Yes, you will be spending most of your nights outside during a PCT thru-hike. But when you cross into a town, it’s common to want a warm bed to sleep in, or a pool to jump into after a long day or week on the trail—which means it’s time to look for lodging. Lodging on the PCT can be expensive, free, or somewhere in between… i.e., affordable for a thru-hiker. Here are the highlights of where to stay, how to get there, and the rundown on what to expect for staying in towns during a PCT hike. Hostels are similar to a hotel, but are usually more affordable and offer more amenities for travelers. Hostels have a chill vibe for hikers. Primarily offering a place to stay for the night, sometimes food, often a hiker box, sometimes laundry services, electrical outlets, bathrooms and showers. All for a relatively low cost. 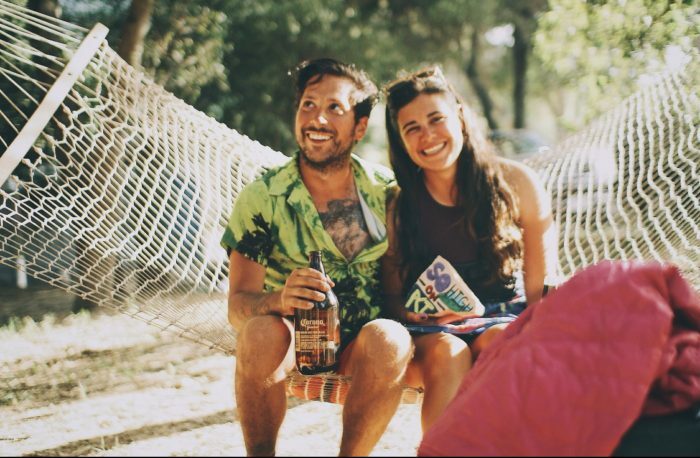 Some hostels on the PCT offer other unique amenities, like a volleyball court, rental bikes, or a fire pit. There are several hostels on the PCT lodging travelers from all over the world. In addition to being an affordable option, hostels are a great way to connect with like-minded people on your journey. Price range: Usually no more than $50 a night, usually no less than $20. How common along the trail: Not super common on the PCT, very common on other long-distance trails. Pros: Awesome environment with like-minded people, cheap lodging and killer amenities. Cons: Less privacy than a hotel, often crowded. Happy hikers at Hostel California. One of the most popular hostels on trail happens to be in one of the most popular trail towns. Once hikers climb over Kearsarge Pass after their first taste of the high Sierra, they will descend into Onion Valley, and likely hitch a ride into Independence, CA. Hikers can hitch from here or arrange a ride to Bishop, CA, which is about an hour drive off trail, but is a very common resupply/town location. Hostel California is a popular hiker hangout, and quotes itself as “The most badass accommodation for climbers, hikers, and all those who hate hotels.” The hostel has rooms with double, triple, and quadruple beds at a low rate; the cost to stay in a single bed in a quadruple room is about $27. Hostel California also has a full kitchen, loner bikes and longboards, computers, an extensive library, VHS movies, and more. Hikers waiting out a snowstorm at the Montaineers Lodge in Washington. 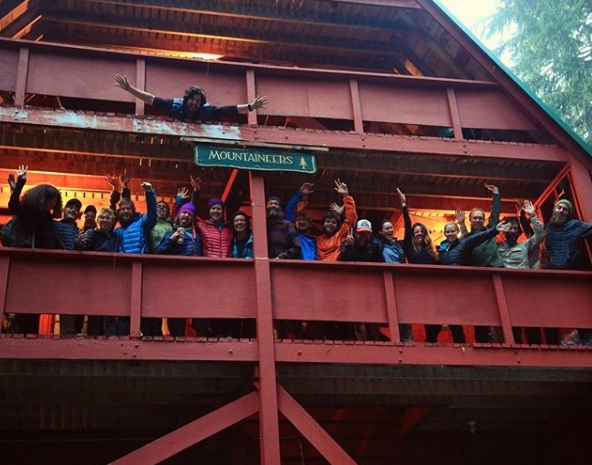 The Mountaineers Lodge is a rustic hostel located near Stevens Pass in Washington. A lot of hikers reach Stevens Pass and hitch to Leavenworth or Skykomish, but the hostel just around the corner (in a walkable distance) is definitely worth checking out. Hikers can stay here for $20 or $30 a night, which includes a bunk in dormitory rooms, showers and bathrooms, electrical outlets, computers, books and games, and dinner. When it’s dinnertime, the guests (often just PCT hikers in season) work together to cook dinner and clean up after after. When it gets late in the season but hikers are still on trail, the Mountaineers Lodge can serve as a safe haven for hikers during a snowstorm. Mellow Mountain Hostel in South Lake Tahoe. 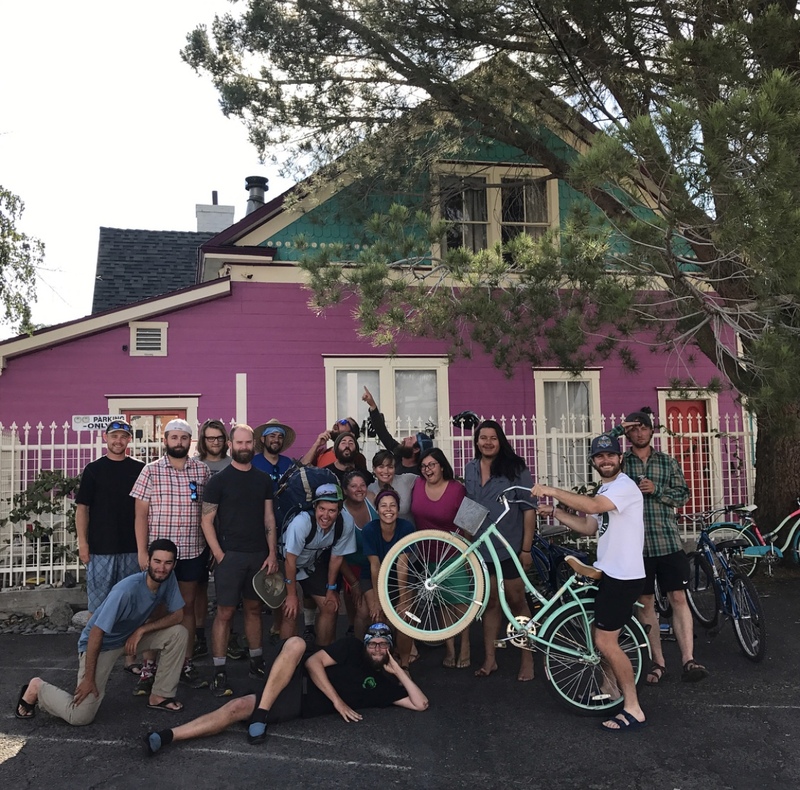 Mellow Mountain Hostel is the only hostel available in South Lake Tahoe. A lot of the hotels in South Lake Tahoe are super expensive, especially when PCTers are hiking through, and this hostel offers mixed-bed dorms, female-only dorms, and private rooms, for around $30/night. Amenities include a computer room and a laundry room, as well as a communal room fully equipped with a full-size kitchen, fireplace, foosball and ping pong tables. 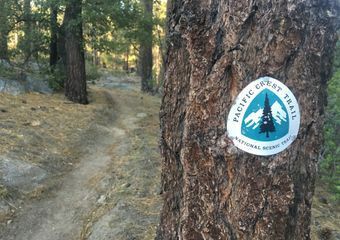 There is no shortage of motels or hotels on the Pacific Crest Trail, and staying in one is almost inevitable while hiking the trail. Motels are a great lodging option for hikers because several hikers can fit in one room and then split the cost. Motels often have a shower, laundry option, sometimes a continental breakfast, and if you’re really lucky, a pool or hot tub. Also, when checking in to a motel on the PCT make sure you tell them you’re a hiker. Some offer a hiker discount. Price range: Anywhere from very expensive ($150+ per night) to moderate $(50 per night). How common along the trail: Extremely common along the PCT. Pros: Hotels and motels come with a private shower, a TV, lots of space, sometimes a continental breakfast and sometimes a pool/hot tub. Cons: There are several hotels along the trail that are not hiker friendly, and some hotels are dirty as hell. Good luck out there. Karma and Teabags at Timberline Lodge. Timberline Lodge is located within Mount Hood National Forest and is your last stop in Oregon before reaching Cascade Locks for NOBO hikers. The hotel is a historic building right on the trail, constructed in 1938 by artisans in the Great Depression, and registered in the National Register of Historic Places. There are several different options for dining, and lodging is available. Lodging here isn’t your cheapest option, but it is something to look forward to as it is in a unique location and building. 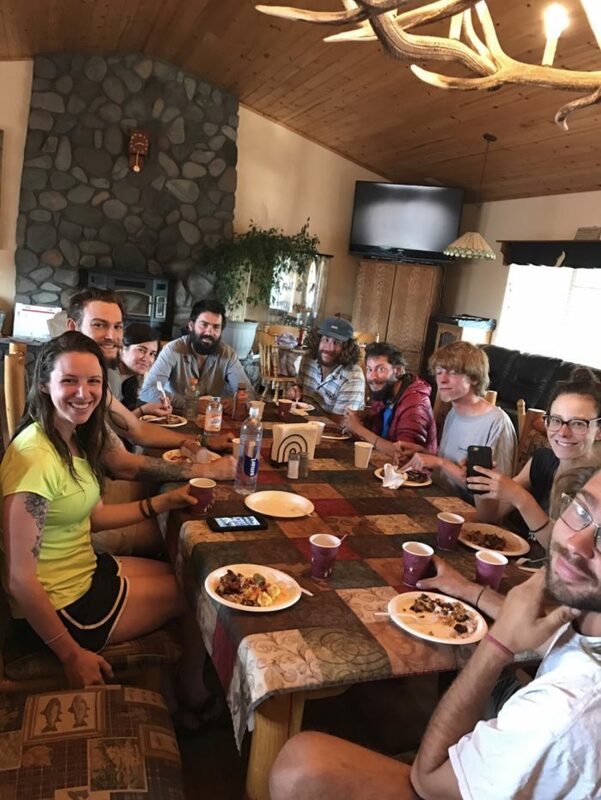 Hikers enjoying breakfast at Burney Mountain Guest Ranch. Burney Mountain Guest Ranch (mile 1,409) is located in Northern California near Lassen Volcanic National Park and is a less than half a mile off trail. The ranch is an awesome stop for hikers because the hosts are amazingly nice and super hiker-friendly. All of the meals are homemade, and delicious. The owner will keep cooking until you’re full. This location accepts resupply packages and is equipped to send packages out. You can pay for a bed (prices vary) or pay to pitch your tent ($25). 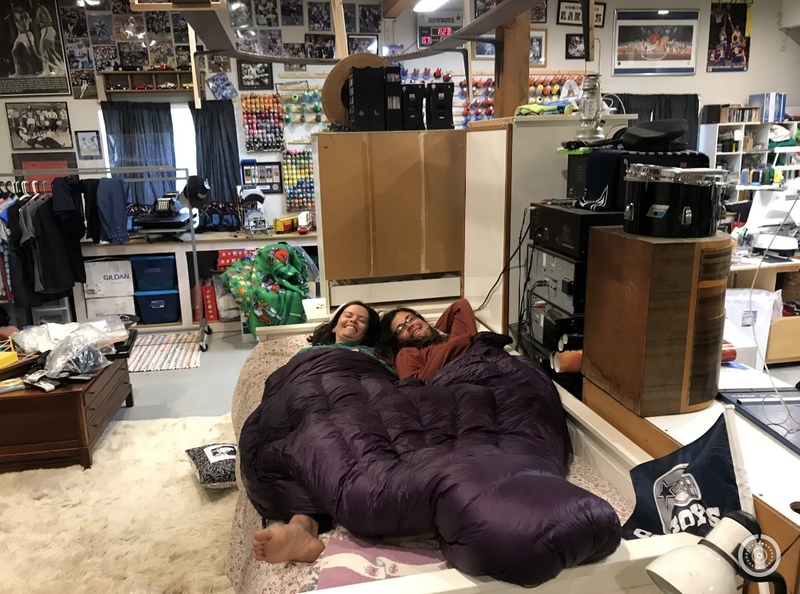 Laundry is available, along with a pool and a small store with great resupply options, and the large deck serves as a great hangout for hikers. Hikers reach Cajon Pass about 20 miles after leaving Big Bear (mile 266). This highway intersection is very popular because of the McDonald’s nearby. It’s a popular spot for hikers to dig into some grub after nearly 300 miles on trail. Nearby is a Best Western, which is extremely hiker friendly, offers a hiker discount, a pool and hot tub, and a guest computer. They also have a free continental breakfast and a hiker box. Campgrounds are a fantastic, typically inexpensive lodging option for hikers. Different campgrounds offer different amenities and prices, but often campgrounds have showers, electricity outlets, filtered water outlets, hiker boxes, laundry, Wi-Fi, sometimes an on-site store. Price range: Usually very cheap, under $20/night. How common along the trail: Very common. Pros: Staying at a campground in town is just like being on the trail, but in town. You are still surrounded by hikers, living outdoors and sleeping in your tent. It’s great. Campgrounds often also have showers, bathrooms, outlets, etc. Cons: Not very private, can be crowded, some have more amenities than others. Nirvana just waking up at Haven RV Park in Lake Isabella. Haven RV Park is located at Lake Isabella (mile 652). Lake Isabella is one of the first stops in the Sierra (according to Guthook), where the terrain is really still transitioning from desert to snowy mountains. This RV park is super hiker-friendly, and costs $10/night to stay. It features laundry, electrical outlets, picnic tables, and has a hiker-hosted fire every night where everyone gathers around roasting hot dogs and sharing stories. Heading out of the campsite is an easy hitch to town, where there are several stores that hikers can resupply at; plus, Nelda’s diner has killer milkshakes. 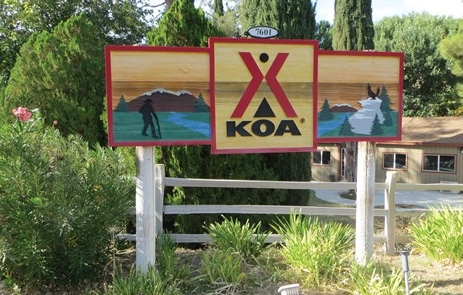 KOA in Acton, CA, welcome sign. Who doesn’t want to stay at a KOA? Just before Hiker Heaven (mile 454) is the very small town of Acton. Hikers pay a $15 nightly rate that includes a tent site, shower, Wi-Fi, and access to a pool. Laundry is also available and the spot has a small convenience store stocked with snacks and ice cream. This campsite also has picnic tables for socializing, and is a good spot to catch a hitch into town if you need to resupply. Karma and SoulShine in front of Lake Odell in Oregon. 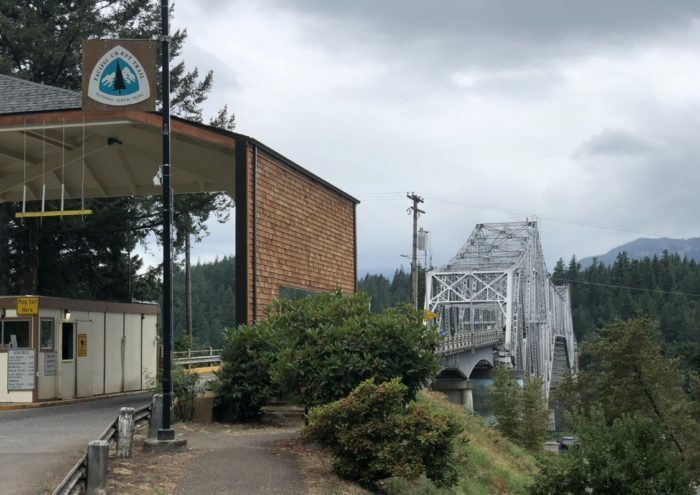 One of Oregon’s cutest campsites, tucked away in the woods on the banks of O’Dell Lake in Oregon, is Shelter Cove Resort and Marina. 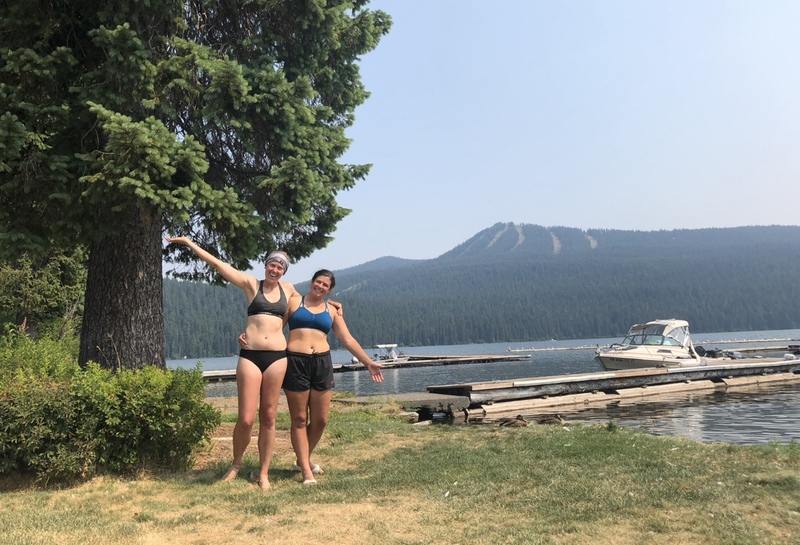 This location has a full-service food truck, a store for resupplying, showers (said to be some of the best of trail), campsites, and a large lake to jump int0 during the middle of summer. The campsites are $10 per tent. O’Dell Lake is known for kokanee and mackinaw fish, so if you’re lucky you may just get some trail magic during your stay from local RV campers. This lodging option also has several cabins that hikers can rent out, but they are usually booked. Bridge of the Gods at Cascade Locks. Cascade Locks is the last stop in Oregon before hikers are in Washington. Camping is available for hiker for $10/night. Hikers camp with beautiful views of the Columbia River Gorge and the Bridge of the Gods. The campground has laundry, showers, bathrooms, and electrical outlets for campers. A brewery is located just steps from the campground and has delicious Oregon brews and a great menu. Trail angels are one of the best parts of the PCT, and it still amazes me that there are people who dedicate so much of their life to helping hikers along their journey. Some trail angels offer rides to and from the trail, some offer a place to send your resupply packages to, some leave trail magic for you to find along the trail, and some offer you their home to stay in while you’re in town. There are huge benefits to lodging with a trail angel, such as free or reduced cost of stay in town, and often laundry, shower, food, and a relaxing place to get some R&R in before you head back out on trail. You can find out about trail angels on your upcoming section via the PCT Trail Angel Facebook Page, and sometimes outfitters in the next town will have a list of trail angels in town. 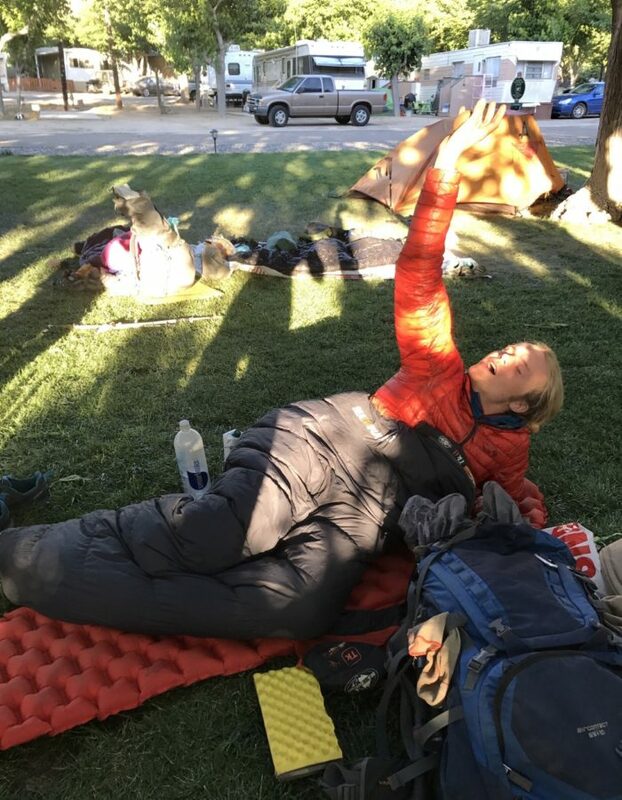 Price range: Usually a donation basis (some trail angels do not expect or accept a donation) but it’s pretty typical among hikers to give trail angels $20 a night. How common along the trail: Somewhat common, depending on the section/town you are coming up to—but the best part about trail angels is it is usually a nice surprise. Pros: So many: Usually a ride to or from town; sometimes food, a shower, privacy, and charging outlets; and getting to know locals in the area. Cons: Sometimes trail angels have restrictions for hikers, restricted parts of the house you can’t enter, specifics on how to do laundry, etc. But you have to remember they are opening their homes to you, and take what you can get. Hikers on the way to Hiker Heaven in Agua Dulce, CA. Hiker Heaven is located in Agua Dulce, mile 454, on the PCT, but you will have heard of it before you even step foot on the trail. Hiker Heaven has all the bells and whistles, and it still amazes me for all the Sofleys do for hikers, at no cost—the Sofleys don’t accept any kind of donation. Hiker Heaven has a Wi-Fi tent with high-speed Wi-Fi, is a resupply location, offers camping and some in-house rooms, laundry services that they do for you, electrical outlets, and more. 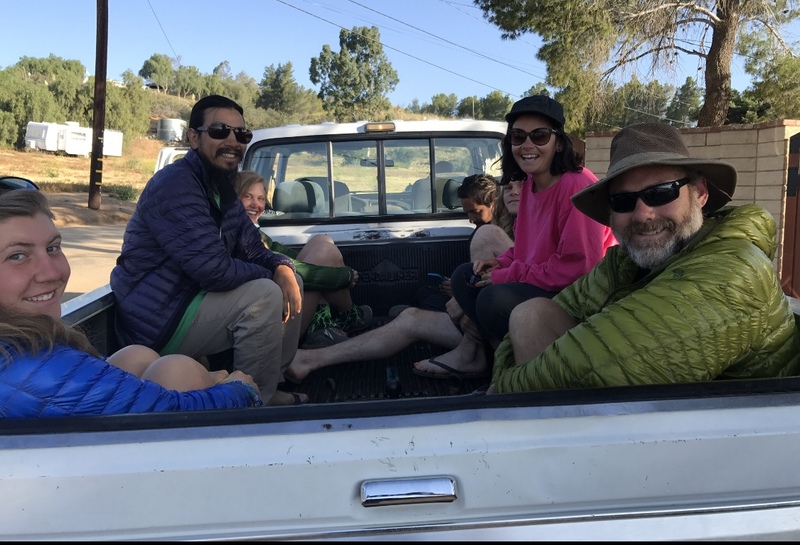 The Sofleys also arrange rides to and from town for dining/resupply, and organize trips to REI for hikers on a needed basis. 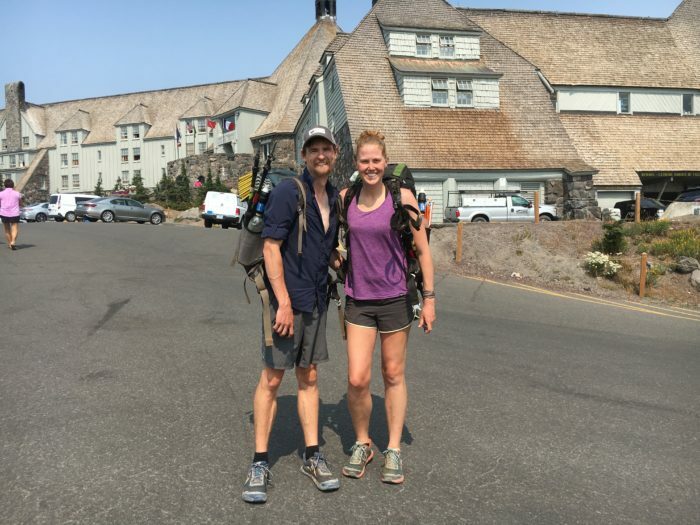 In the heat of the season the Sofleys do check for PCT permits as their lodging limit is 50 hikers/night, but if you don’t have permits you are still welcome to come charge your devices, pick up your resupply box, and enjoy your day. Twerk and SoulShine at Casa de Luna. Just 20 miles from Hiker Heaven is Casa de Luna. This spot is home to a wild trail angel who provides camping, food, and a whole lot of fun for hikers. This location is where hikers are known to dance for their “PCT class of ___” bandanas and paint rocks that are left in the forest for hikers to see when pitching their tent. Casa de Luna does encourage a donation to be able to keep the services going for years to come. A commemorative photo is taken daily at Casa de Luna and can be found later on their Facebook page. Sprite and SoulShine at a trail angel’s house in Wrightwood, CA. A lot of times hikers will stumble into finding trail angels when searching for housing in town. One of my best experiences with a trail angel was in Wrightwood in the desert section, where a family approached me and two other hikers and asked if we needed housing for the night. They drove us to their house, and offered us a warm bed and shower in their upscale basement. We shared stories that night, did laundry, and went to bed early. The next morning the family made us a full spread of breakfast and offered us a ride back to trail. Bits of magic like this are everywhere on the Pacific Crest Trail and it’s likely you will encounter an experience like this for yourself. I’m the owner of the Andruss Motel (andrussmotel.com) in Walker, Ca and along with my place we have plenty of other places for hikers to stay, rest, resupply, and get laundry done in town. We are the same distance as Bridgeport from the Sonora Pass, but not as crowded and much more affordable. Several places in town, including the Walker General Store, are willing to receive shipments.